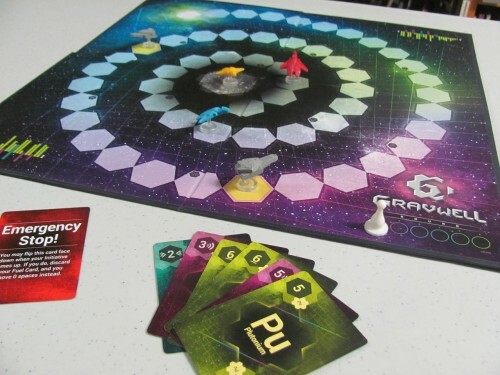 Newly released from Cryptozoic Entertainment, Gravwell is a simple spaceship racing game—simple, but not easy. 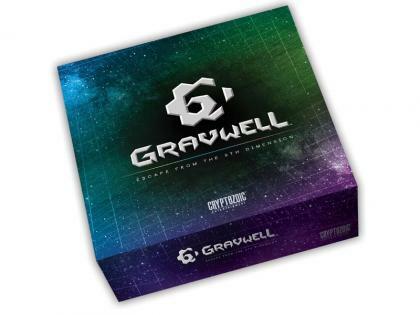 It’s not difficult to understand Gravwell; it doesn’t even take long to play. But the game will make you think. 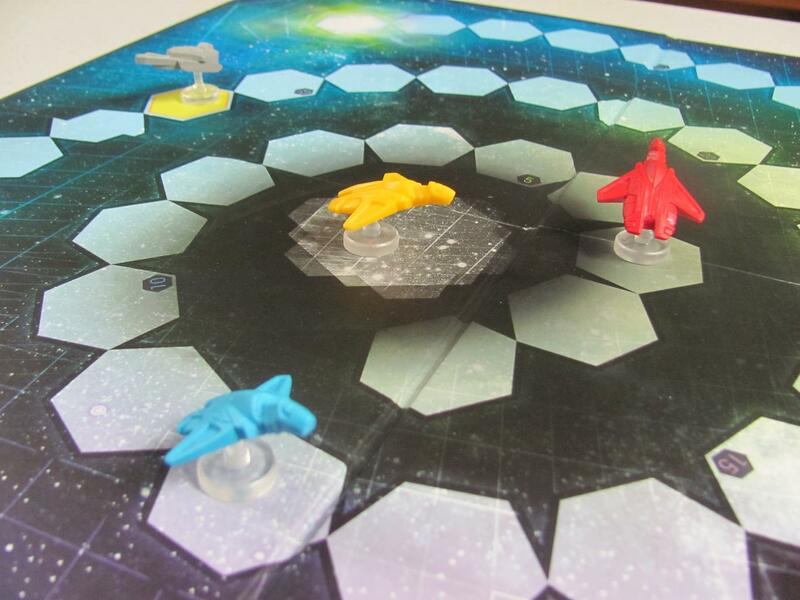 You see, Gravwell is a racing game with a twist. To win, the players must pull and push their ships off each other in order to escape a gravity well. The idea is that the spaceships have lost their engines and must rely on tractor beams. The beams are represented by cards, which played simultaneously, once per turn, six turns per hand, each contain a unique letter, number, and direction combination. Each turn, after the cards are reveled, they’re executed in alphabetical order, moving the players’ ships a number of spaces either toward the next closest ship or away from it. At the point each turn of choosing which card to play, a player knows whether the closest ship is ahead or behind. The problem is that because the cards are executed in alphabetical order, by the time a player actually moves his ship, the relative position of the other ships may have changed! Now at first, this may make Gravwell seem a bit chaotic and random. But with a little practice and careful attention to the cards that the other players have drafted and played, a person is usually able to develop better control and keep the general progress of his ship moving forward. Of course, there are surprises, as well as some luck in drafting a new hand of cards for each round. But for me at least, that’s what keeps Gravwell exciting and fun. It’ll make you cringe when you miscalculate and your ship ends up moving backwards. And it’ll make you cheer at amazing come-from-behind victories. Just remember to keep your eye on the other players as much as on your own hand of cards. I received a copy of Gravwell free from the designer.